The Kray Twins were two of the most ruthless and notorious gangsters in British history. Brutal men who used violence and intimation across London, inexplicably hailed as heroes by some. They were celebrities in their day and people interested in true crime are still fascinated by them. The twins are getting a new cinematic telling with Tom Hardy taking on both roles. Reggie Kray is a leading gangster in the East End of London when he meets an attractive young woman, Frances Shea (Emily Browning). The pair quickly fall for each other. But Reggie has a twin, Ronnie, a violent old school gangster with paranoid schizophrenia. As the twins rise up the London underworld, conquering the West End, Reggie is torn in several different directions, from Frances wanting Reggie to go straight, Ronnie pulling Reggie deeper into the criminal world, a rivalry between Ronnie and the Krays' business partner and one very demanding copper wanting to bring the twins down. 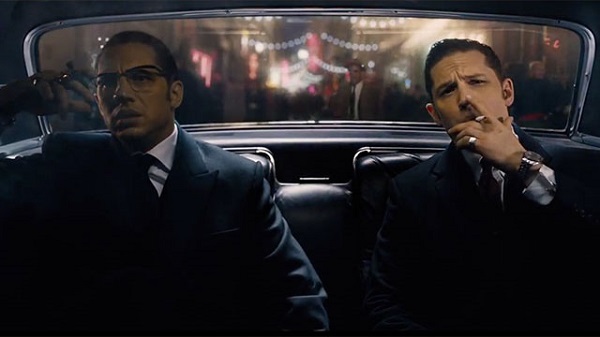 Legend is very much Hardy's movie, showing his amazing talents as an actor, pulling double duty as both twins who are very different to each other. Reggie is the cool, more rational one of the two and the center of the movie while Ronnie, wanting to use violence to resolve any issues, comes up with illogical schemes and has old-fashioned views on how a gangster should act. Reggie looks and sounds how Hardy normally looks, while Ronnie wears glasses, has slicked back hair and spoke with a mumbled lisp. Ronnie has a brazen attitude, openly speaking about homosexuality at a time when it was illegal and willing to fight anyone and everyone. Both were challenging roles for Hardy, particularly when he has to speak, argue and physically fight himself (though that sequence required the use of body doubles and creative camera angles), and he does it brilliantly. His performance as Ronnie has an air of his role in Bronson, someone who is unhinged and enjoys getting into fights while as Reggie, he suffers a number of dilemmas as he is torn between his loyalty to his woman and his brother. Even the approaches in their choice profession is different, Ronnie acting like a bulldozer while Reggie leads people into a false security before using violence: this is used to highlight the animosity with the indebted Jack 'The Hat' Mcvitie (Sam Spruell). Ronnie is someone who wants to use force to solve any problem, putting him into direct conflict with Reggie and their business partner Leslie Payne (David Thewlis) who wants to run a more sophisticated operation and acclimate with the times. It is one other pull on Reggie in their world, seeing the long term prospects yet his brother drags him down. 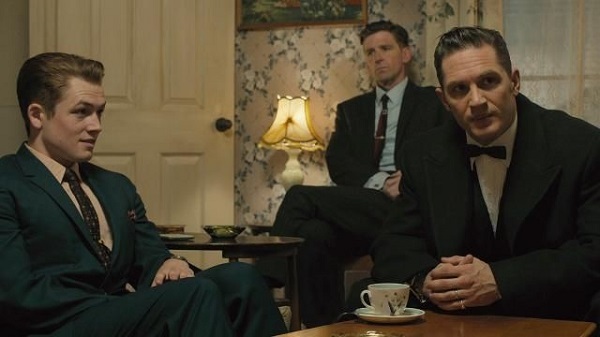 Aside from Hardy, Legend has a strong supporting cast, having Emily Browning, Paul Anderson, Kingsman: The Secret Service's Taron Egerton, Tara Fitzgerald and Christopher Eccleston. Browning was central to the movie, being narrator and the character trying to get Reggie to move away from crime, giving the movie an arc around their relationship. Frances giving an outer prospective to the crime enterprise, someone who is innocent, fragile, yet smart. Yet Ronnie and Frances do have a duality, they both have mental health problems, Ronnie's schizophrenia and Frances' depression. Both need to use pills to temper their conditions and their behaviour. It is one of Browning's best performances. However Browning is given some over ripe dialogue during her narration, calling the Krays "The Gangster Princes of the East End", talking about how the upper classes mingle with gangsters in the Krays' casino for the rush of danger they can receive and referring to a Rolling Stones song title. But this is the fault of writing, not Browning. 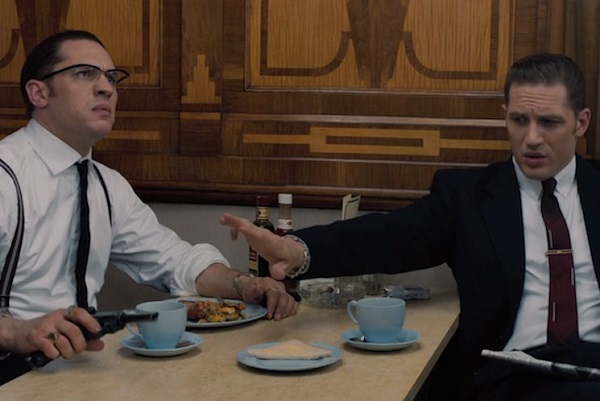 Though the story of The Krays is a very British one, Legend was written and directed by an American, Brian Helgeland. Legend was like a British set version of a Martin Scorsese movie, particularly Goodfellas and Casino. 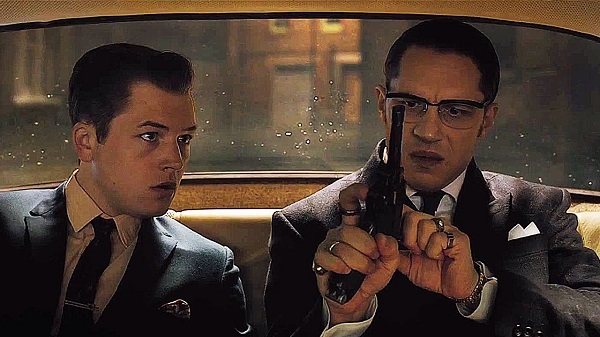 Like those movies, Legend has a period setting, uses narration to describe events and set the picture for people who are unaware of the history, such as the Krays conflict with the Robertson gang from South London. The plotting, storytelling and style follows the form of Scorsese's gangster movies and it is a good copy. Even the injects of humor are in the style of Scorsese, from a gangster being arrested during a very important sporting event and Ronnie's jokes and crazy ideas. It is basically a British Goodfellas with the character elements of Casino; Reggie being the rational Robert De Niro character and Ronnie is Joe Pesci, a violent maverick. Helgeland even copies Scorsese on a technical level. Many of the shots and framing were similar to what is seen in Scorsese's movies and Helgeland particularly enjoyed using steadicam shots, following characters from behind as they enter into a building, whether it is for a simple action or to commit a crime. It is like the scene when Henry Hill enters the club with Karen. One of the most impressive ones, is early in the movie when Reggie and Frances are out on their first date going to a club, following them around the building before Reggie is called on to do some gangster business. It was an impressive feat of cinematography and editing, lasting five minutes on screen. Back in 1990 Martin and Gary Kemp of Spandau Ballet fame started in The Krays. Both Legend and The Krays look at the same events but do it in different ways. The Krays had a gritty, low key style while Legend had a Hollywood gloss to it, being brighter and more glamorous, being able to show The Krays being able to mingle with celebrities and politicians and how political influence keep . Both movies do look at the brotherly bond between the Krays and their loyalty to each other, but again have different approaches. The Krays focus is on the influence of their mother, a dominating Eastender matriarch while Legend is about the relationship between Reggie and Ronnie. Former Doctor Who star Christopher Eccleston was given the role of Nipper Read, the police officer determined to bring down the Krays. However, it seems that much of his role was left on the cutting room floor as there is little about the police investigation into the Krays. Legend continues in a tradition of great gangster films that should please fans of the genre on both sides of the Atlantic, mixing an American style of filmmaking with a very British story and setting. Tom Hardy is deserving of all the praise he is getting for his duel performance.